Q: What is Shadow Era? A: Shadow Era is a free to play, online collectible trading card game (TCG or CCG) for the web, PC, Mac, iPhone, iPad, and Android. A: All versions will be free to play, featuring the option to earn new cards through gameplay or purchase additional booster packs. Shadow Era is probably the most inexpensive digital TCG out there, with packs of 15 cards costing the equivalent of $0.99. Q: What do you get for free? A: When you first start the game, youcan choose your starting hero, from Warrior, Hunter, Mage, Priest, or Rogue. The class you choose will determine which free class deck of 40 cards you will begin the game with. It is entirely possible to continue playing the game indefinitely without having to pay anything, and still remain competitive! Each time you level up, you will also earn Shadow Crystals that are used to buy booster packs or special class decks. And just like regular TCGs, you can fully play the game with only the free starter deck, however by purchasing the booster packs you can get rare cards, and many different expansions will be offered in the future with a lot of new card series. The game also features a trading system, where you can sell your unwanted cards for gold, and buy new cards using your in-game gold. Q: Are my iPhone and Online accounts different? A: No, Shadow Era is a cross-platform game, and when you use the same login information you can play with the same account from any supported device. Q: Do I need a constant internet connection (for instance, if I have an iPod Touch)? A: Yes, Shadow Era is an online game and currently you will need an internet connection to log in, retrieve available quests, and be rewarded for your battles. However, there is also an offline play mode where you can practice against the AI but not earn any experience or gold. Q: What is the gameplay like? A: Shadow Era is inspired by more strategic card games such as Magic the Gathering and World of Warcraft Trading Card Game. You will build a deck from a total of 350 unique cards with some of the most amazing art you have ever seen. Complete missions against the Shadows, or battle against other players to gain experience, and win Shadow Crystals to buy new card packs each time you level up! The core card game is most similar to the WoW TCG. Each side has a main Hero character, and you can recruit Allies to join the battle. The objective is simply to kill the enemy Hero, but obviously the challenge is to also keep your own Hero alive. Should you take out the enemy Allies first, or go straight for the Hero? That\'s for you to decide... To further add to the strategy, there are weapon and armor cards to improve your Hero\'s stats, as well as ability and spell cards. Q: Does it have multiplayer? A: Yes, you can play against someone in realtime using any of the supported platforms. Q: What are the icons on the cards? A: Top left: Casting cost. In Shadow Era, each turn you can choose to sacrifice a card to gain energy, that will allow to to bring new cards into play. Top right: Class restrictions. 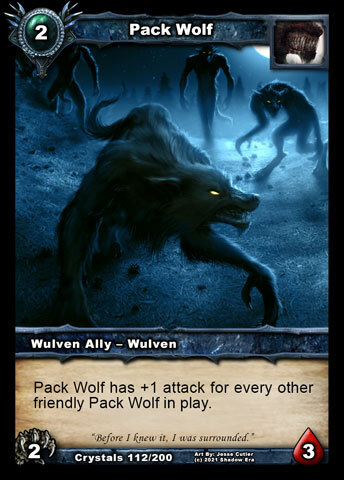 The icon identifies this card as only being available to Wulven Heroes. Bottom left: Attack damage. You can choose the target of your attack, and you will do this much damage to them. Bottom right: Health. Be warned that your target will also fight back! When the card\'s health drops to 0, the card is removed from play. If you lose your hero, then you have lost the game. Q: What types of cards are there in Shadow Era? Currently there are over 600 cards already in the game, with more being added with each set. For the full card list, please check here. Q: What cards come in booster packs? A: Booster Packs contain 15 random cards - 10 common, 3 uncommon, 1 rare or epic, and 1 hero card. There is also a 1 in 5 chance to get a premium foil card that replaces a common. The cost is 100 Shadow Crystals, which is about $1 or 4 levels of experience. Q: What are the deck construction rules? - cards can only be included that share a trait with your hero: same faction (humans/shadows), or same class (warrior ability, etc). There are also neutral cards that can always be included in any deck. For example, let\'s say you have a Human Warrior Hero. You can use a "Warrior Ability" card (since your Hero is a Warrior), or also a "Human Ability" card (since your Hero is a Human). You will not be able to use any other class cards such as "Mage Ability" with your Warrior deck, nor any "Shadow Ally" or "Shadow Ability" cards. Q: Why does the card I just purchased say unusable? A: When constructing your deck, you must follow the deck construction rules as seen above. The cards you can use in your deck are based on the Hero you choose for that deck. You can either purchase the correct Hero and start building a new deck, or sell the card back to the Merchant. Q: How do weapons and armor work? A: Weapon and Armor cards are special items that can be used by Heroes. One of the icons in the top right of the item card must match the icon on the Hero card, as these items can only be used by certain classes they were designed for. Weapons will allow the Hero to attack and defend, while armor will absorb melee damage. Both weapons and armor have a durability rating, as shown on the anvil icon, which is used up for every attack or defend action. When the durability reaches 0, the weapon or armor is destroyed. Also, only one weapon and one armor card can be in play at a time, and any old items are automatically destroyed if a new one of the same type is played. Q: How does the Merchant work? A: The Merchant is an NPC that buys and sells cards using in-game gold. He has a real, shared global inventory that can even be sold out. He will occasionally restock his inventory and adjust his prices up or down according to demand. This system is designed to simulate a player-run free market without the potential for abuse in a free to play game. Q: How are the multiplayer ratings calculated? 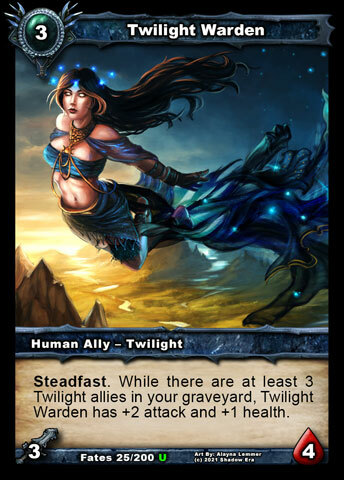 A: The rating system used in Shadow Era is similar to True Skill on XBox. Basically the system uses fancy mathematics to track your rating and how confident the system is about that rating. As you play more games, the system becomes more confident in its rating of you, and there is less change in your rating no matter if you win or lose the occasional match, unless there is a real trend in one direction. Eg you are suddenly able to constantly beat high-rated players, then your rating will go up to indicate that. There\'s a lot of info you can read about True Skill but it\'s a very accurate rating system, once you understand that it is a rating and not a score that is supposed to always increase. Q: Will the game be translated into other languages? A: We realize that the world is a very big place, and we want to offer the game localized in as many languages as possible. We will be translating to: French, Italian, German, Spanish, Japanese, Chinese, Korean, Dutch, Polish, Russian, Swedish, Portuguese, Czech, Norwegian, and Vietnamese. Whew! Translations will be done by professional translators, and includes localized card images as well as all text and GUI elements in the game. However, official community discussions such as the forums will remain in English only. Q. Can I release/monetize videos of Shadow Era on YouTube? A: Yes, Wulven Studios gives permission to release and monetize videos on Youtube, or other video sharing websites, using Shadow Era content, as long as the content is used in the context of the Shadow Era game and/or Shadow Era community. Q. Can I create a fan site? A: Yes, you can create a site using copyrighted Shadow Era content, as long as it remains within the context of discussing and/or promoting Shadow Era. Please refer to the full fan site license here. Q. Where do I redeem my code? 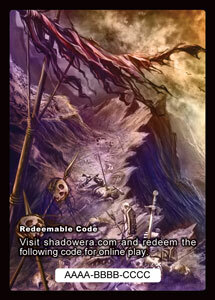 A: Each physical booster pack includes a redeem code for shadow crystals in the digital game.